Silver Service with Hog Roast Prestwich! It was a huge team effort this week for the hardworking chefs and catering assistants at Hog Roast Prestwich, as they were hired by Jennifer to cater for a formal dinner party with a large number of guests. Jennifer wanted a three course meal with her professional friends and colleagues, but also wanted privacy. She decided to host the event at her own, very spacious home, so they could avoid going to a restaurant, which brought her to us. We spoke with Jennifer about her choice of menu, and other aspects of service that she desired, before arranging a date and time. 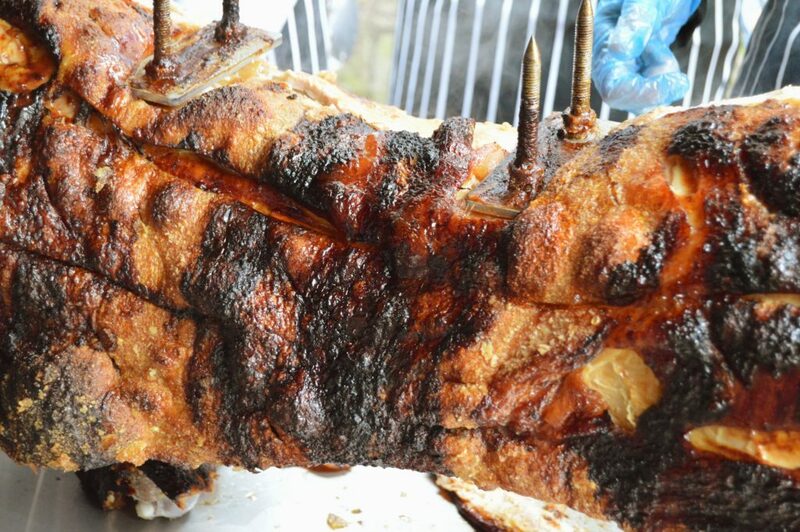 It was an eight o’clock serve time, and so the team from Hog Roast Prestwich were on site for twelve noon. There was a variety of food on offer for the night, and so we brought two of our trusty machines, in order to have everything ready at the same time. In addition, the catering assistants and waiting staff set to work preparing the room, by arranging tables to form a large dining table, laying table cloths, cutlery, candles and champagne flutes, as well as putting the champagne on ice and decorating the table with rose petals. There were sixty guests attending the formal dinner party, who were all treated to champagne and a selection of canapes upon arrival. Among the options were the Pate Encroute, the wild Mushroom Bouchees and the Chicken Satay with peanut dip. Soon it was time for starters, and there was a choice of the Smoked Salmon with prawns and avocado, served on a bed of curly endive with mustard and dill dressing or the fresh, homemade Tomato Soup with crusty bread rolls. Once the guests had finished, their plates were cleared and drinks replenished by our professional waiting staff, followed swiftly by the mains. In addition to the Spit Roasted Pig, guests also had the option of a Spit Roasted Chicken served with stuffing and homemade onion gravy, or the Spit Roasted Sirloin of Beef served with Yorkshire puddings, horse radish sauce and homemade red wine gravy. All of the mains were served in accompaniment of a seasonal vegetable medley and roasted new potatoes. Finally for dessert, the chef had prepared his special Sticky Toffee Pudding with Ice Cream and yummy toffee sauce. After a long night of hard work preparing exquisite cuisine, it was time for the team at Hog Roast Prestwich to tidy away their mess discreetly, and leave their guests to enjoy the rest of their night.